“I like the idea that I can teach guitar anywhere in the world,” said Gilbert, “from my studio in L.A. or from the back of a car driving through London!”. 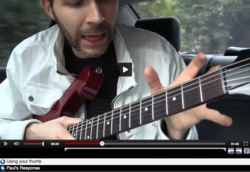 ArtistWorks, the only provider of online music lessons that give students Video Exchange™ feedback, announced that guitarist and ArtistWorks Online Rock Guitar School teacher Paul Gilbert became the first person in history to give a Video Exchange Feedback lesson from a moving vehicle. All ArtistWorks world-renowned music teaching artists utilize a patent pending technology that allows students to not only view a comprehensive collection of online video lessons, tab and backing tracks, but also submit videos of their practice sessions and seamlessly receive video feedback from super-players like Paul Gilbert. These Video Exchange interactions are paired together with the video lessons and made available to the entire community of students to learn from. Gilbert’s Online Rock Guitar lessons launched in May to become the fastest growing school in the ArtistWorks stable of twenty-three schools covering everything from online vocal lessons to classical flute. Gilbert’s mobile guitar lesson on thumb technique became part of a concentrated blitz that resulted in hundreds of personalized Video Exchange lessons in a 10 day period. It should be noted that Gilbert was not driving at the time. He was in London heading to a UK show, so no additional carbon was emitted in the teaching of this lesson. To see Paul’s mobile Video Exchange online guitar lesson click here. “I like the idea that I can teach guitar anywhere in the world,” said Gilbert, guitarist for Platinum-selling band Mr. Big among many other credits, “from my studio in L.A. or from the back of a car driving through London!”. In addition to his daily role as teacher at his ArtistWorks School, Gilbert is currently preparing to tour in support of his new CD, Vibrato. The ArtistWorks Online Rock Guitar School fulfills ArtistWorks’ mission of helping everyday people across the world fulfill their passion for playing music by getting personalized music lessons from their idols. Membership starts at $90 for three months of unlimited access. Founded in 2008 by former AOL executive David Butler, ArtistWorks, Inc. is the leader in a new generation of online learning platforms that enable personalized interaction between master teachers and average players. Their revolutionary global learning community of world-renowned teaching artists and enthusiastic amateurs is dedicated to unleashing the music that lies within all of us. This “next generation” Video Exchange Accelerated™ Learning Platform enables virtuoso musicians to "teach the world" by presenting their musical legacy in the form of HD video lessons to subscribing students. Utilizing simple web cams, smartphones, tablets or video cameras, students are able to submit practice videos and get individualized video feedback and guidance from their teaching artists - creating a constantly evolving two-way, online learning experience. ArtistWorks currently offers schools from such world-class, virtuoso artists as: Paul Gilbert (rock guitar lessons); Martin Taylor (fingerstyle guitar lessons); Jason Vieaux (classical guitar lessons); Andreas Oberg (jazz guitar lessons); Jeannie Deva, (online vocal lessons); Jeffrey Khaner (flute lessons); William Caballero (French horn lessons); David Bilger (trumpet lessons); Ricardo Morales (clarinet lessons); Nathan East (electric bass lessons), John Patitucci (jazz bass lessons), Howard Levy (harmonica lessons); DJ Qbert (DJ lessons); Christie Peery (piano lessons); Thomas Lang (rock drum lessons); Billy Cobham (jazz and fusion drum lessons); Luis Conte (percussion lessons); as well as the ArtistWorks Academy of Bluegrass with Tony Trischka (banjo lessons); Missy Raines (double bass lessons); Bryan Sutton (flatpick guitar lessons); Andy Hall (Dobro lessons); Mike Marshall (mandolin lessons); and Darol Anger (fiddle lessons). For more information, visit http://www.ArtistWorks.com.